The ingredients in a Margarita pizza typically include olive oil, mozzarella cheese, tomatoes and basil. While this Italian dish might satisfy your taste buds, it may not be as kind to your diet. However, if you are making your own, using low-fat cheese and making a thin crust can mean a more diet-friendly pizza. The American Dietetic Association estimates that the average number of calories in one serving, or one slice, of Margarita pizza is between 200 and 300 calories, depending on the size of the pizza and the thickness of the crust. 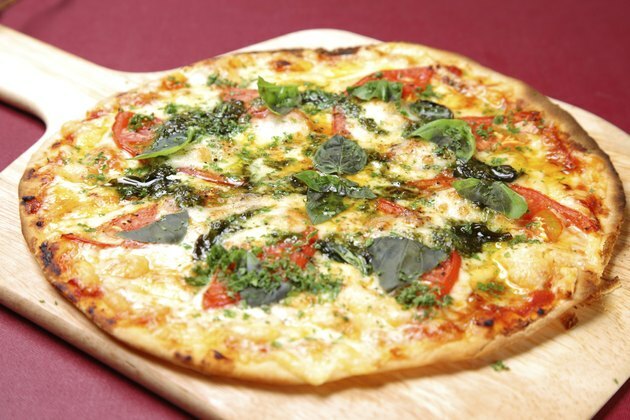 There are about 12 to 13 grams of fat in each serving of Margarita pizza. One slice can also contain as much as 500 to 600 milligrams of sodium. Keep in mind that the American Heart Association recommends limiting your sodium intake to 1,500 milligrams per day. Adding toppings to your Margarita pizza will increase the calories. However, if you want to add toppings and keep the calories down, try adding light toppings like sliced red onions, spinach, mushrooms and steamed broccoli.